It is the capital city of the Department of Madre de Dios, situated in Southeastern Peru, on the banks of the Madre de Dios River. Given the vast record of species of flora and fauna present in its forests, Puerto Maldonado was granted the title of “Peru´s Capital City of Biodiversity”. Its humid tropical climate offers high temperatures, especially in August and September, with a thermic sensation that gets close to 50°C (122°F), whilst between October and April, there are strong rainfalls, with a high humidity level, and the average annual temperature, in the area, is 25.4°C (77.7°F). The Madre de Dios River´s high waters allow for navigation and, all along its course, there are several Peruvian national parks and reserves, such as the Manú Biosphere Reserve, Bahuaja-Sonene National Park, Tambopata-Candamo National Reserve and, on Bolivian territory, the Manupiri-Heath National Reserve. The National Tambopata Reserve is a protected natural area that seeks to conserve the flora, fauna and ecological processes of part of the humid tropical forest, and to generate conservation processes that ensure the sustainable use of its natural resources and landscape. Among its most common ecosystems, are the aguajales, marshes, pacales and riverbank forests, the physical characteristics of which allow local inhabitants to take advantage of their natural resources, in a sustainable manner. Without a doubt, Puerto Maldonado is one of the best places, to discover the Amazon, as it offers one of the world´s highest biodiversity index, with about 200 species of mammals, 1,200 of butterflies and over 10,000 species of vascular plants, among countless others. Sandoval Lake is the reserve´s main and most visited attraction, as it is the habitat of macaws, river otters and several species of monkeys that can be observed from a watchtower that offers an excellent panoramic view of the immense surrounding landscape. The “collpas” or macaw licks are located on riverbanks, and become mass gathering spots to thousands of macaws, parrots, falcons, etc., between 5:30 and 9:00 a.m. In contrast, the hillside organic soil collpas, like that called “Colorado”, allow one to observe mammals like the sajino, huangana and sachavaca (Tapir). 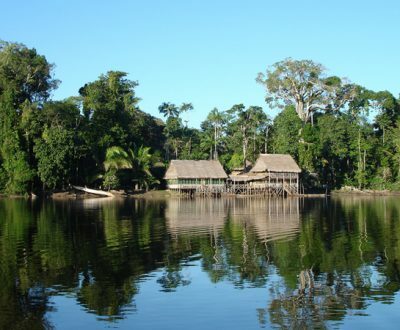 Tambopata is the ancestral territory of the Ese Eja native ethnic group, many members of which presently work with private companies, to offer diverse tourist activities and services, such as accommodation and guided visits.